All Alfa Romeo 147 Twin Spark Problems, Resolved. Are you having Alfa Romeo 147 Twin Spark problems? Are you planning on purchasing a new Alfa Romeo 147 and your wondering what problems may arise in the future, or do you already own a 147 and looking for a 1 stop shop for all Alfa Romeo problems/answers. Here at RepairBooks we try our best to help out as much as we can. As for the common problems on these cars, sadly to say the list is too long to mention all known problems, but we will attempt to a shorter list. We regularly get emails from customers stating that they can hear a dull banging coming from the suspension area, especially if the car is on rough terrain. While talking to our friends at Alfa they seem to think this is probably sue to a issue with the suspension arm. A solution to this problem (unfortunately is to replace the arm) – for best price on this item – (https://www.eurocarparts.com/suspension-arm-and-suspension-joints), if you need help or adivce fitting the arm, consider purchasing our official Alfa Romeo 147 repair manual. Another one of the many Alfa Romeo 147 Twin Spark Problems and a very common issue with the 147, is a rattling noise coming from the engine bay, especially from the petrol version of the car opposed to the diesel, in fact this noise can make the petrol model sound more like the diesel, this is probably due to a timing variator, as this is a very common part to fail. Again, unfortunately the best fix / work around for this problem is to replace the whole variator. Tip : if replacing this part it maybe work replacing the timing belt also, this can save you time and money in the long run. For more information on repairing, servicing or just tinkering with your Alfa 147, consider downloading our official repair manual from link above or buy click the buy now button below. 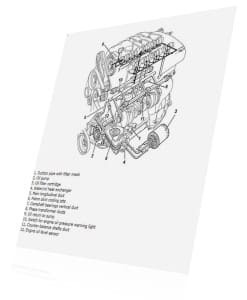 These manuals contain several thousands of pages of know how and in depth knowledge on the Alfa Romeo 147. ← Have you got Nissan Note Problems? All issues resolved.